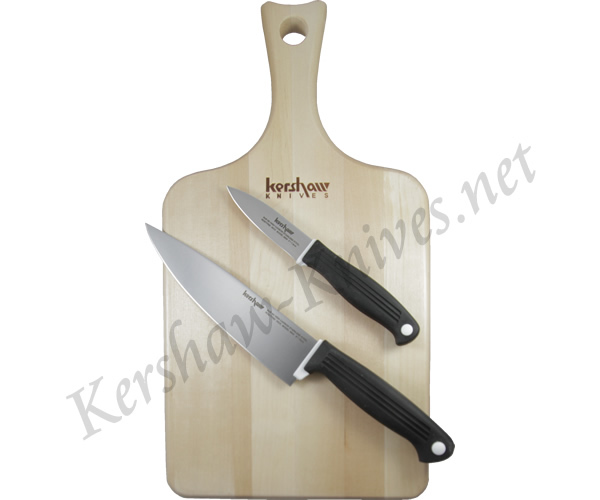 The three piece Kershaw Cutting Board Set CB-3 makes a great addition to any kitchen. The cutting board is made from maple in a traditional paddle shaped design. The Kershaw logo is emblazoned across the surface of the board. There are two knives included with this set: a 6 inch Chef knife and a 3 inch paring knife. The knives are constructed of AUS-6A steel and are razor sharp upon arrival. The handles are non-slip Kraton for a safe, secure grip.